design of the week | Get the Word out! This week’s design is called Leaves Change. The design shows a photo of fall leaves that fades out from color to black and white to nothing. You’ll also see that the design has an ornate frame and the phrase “I, the Lord, do not change” which is found in Malachi 3:6. The basis for the design is the idea that everything we know changes. Time continues on and almost nothing stays the same. People get older, days get shorter/longer, and seasons change. In the fall the leaves of deciduous trees all change colors and fall off in preparation for winter. With all of these changes going on, we get used to it. We also take for granted that things change and expect all things to be like that. This can be difficult when we’re facing problems and need something/someone to be consistent. This week’s design is called Eyesore. These are interesting to say the least and I have a response to each of them. When people say that the Bible says not to judge, my first response is “Where?”. I find that 90% of the time, they don’t even know where it says that and they’re just repeating something they heard from someone else. When someone tells me that I can’t judge them because only God is their judge, I can’t help but smile. I wonder if the people actually realize what they’ve just said. My response is something along the lines of “Well, at least we agree that God is going to judge you…” My response for the last statement is different depending on the attitude of the person, but usually talks about how they are like everyone else. I tell them about how all have sinned and fallen short of the glory of God. That their sins will send them to hell just like everyone else. The truth is, the Bible doesn’t say that it’s wrong to judge. In John 7:24 Jesus says, “Do not judge by appearance, judge by righteous judgment”. He doesn’t say that it’s wrong to judge, just that we shouldn’t judge by appearance. This coincides with Matthew 7:1-5. In this passage, Jesus talks about not judging and says that we should take the log out of our own eye before we take the speck out of our brother’s eye. He never says that we shouldn’t take the speck out of our brother’s eye, only that we should take the log out of our own eye first. This means that if we are dealing with a sin and committing that sin, then we really don’t have any ground to tell someone else that that sin is wrong until we deal with it in our own life. Jesus says this because He has just gotten done telling His disciples not to act like the Pharisees (who were judging others for sins they were committing) and pagans. Christians have been given the righteous judgment of God. If we use His judgment to determine where others stand in relation to Him, or to tell others that something is wrong, then we have judged by righteous judgment (if the scripture is in context!). We are to tell others that sin is wrong so that they understand their need for a Savior and will repent of their sins and put their faith in Christ. Where do you stand? 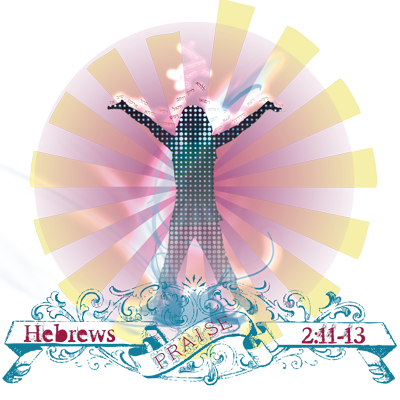 This week’s special design is called Praise (In His Presence). The design uses some simple graphic elements as well as color to portray the love and joy of being in the presence of God and praising Him for what He’s done for us. As Christians, we have the privilege to come before the throne of God with boldness/confidence to ask Him for grace and mercy in times of need (Heb. 4:16). We also have the joy of praising Him for protecting us, providing for us, and most of all saving us from certain destruction. He has given us much to be thankful for and deserves to be praised just for who He is, much less what He’s done. If you’re having a rough day, you can still praise God for who He is. Life in itself is a blessing. He is good to us and even disciplines us because He loves us. If you are having a great day, then rejoice! It is a perfect time to lift up your voice and sing to the Lord of Heaven. If you’re not born again, then much of this probably doesn’t make sense. Christians rejoice because God has, in His grace, decided to forgive us of our sins and erase them. He has cleared our consciences of guilt and made us His own. He has saved us from His wrath and allowed us to have the assurance that we will be in heaven when we die. If you don’t have any of that, then you are in danger, regardless of how great your life is. The Bible says that it is appointed unto man once to die and then the judgment (Heb. 9:27). Once you stand before God, He will judge you for every thought, word, and deed committed in your life. All the lies, lusting, theft, disobeying your parents, hatred, and other sins will be laid bare before God and if you have no way to pay for them, you will be cast into hell for eternity. This may seem unfair, but it would to a criminal wouldn’t it? It is right because God is holy, just, righteous, and perfect. He is eternal as well, so punishment in hell is the only just action to be taken. But, God has made a way for you and I to be spared this tragic end. If you will repent of your sins (turn from them) and put your faith in Jesus Christ and His death on the cross to pay for your sins, the Bible says that you will be born again and that you can have the same assurance that when you die, you will be saved from hell and enter heaven; not because of what you did, but because of what Christ did. Will you do it? Will you repent of your sins and put your faith in Christ? If so, then you and I can praise God together today! Design of the Week – Arise! This week’s design of the week is called Arise! This week’s design is a new one hot off the presses. The design is called Regenerated! The design is a play on the recycle emblem. It shows a gradient of color moving through it from a dark green through yellow to a dark blue. The upper and lower right arrows are normal, but the lower left one has broken out of the cycle and points heavenward. The design says “Reduced. Reused. Regenerated!”. The point of the design is three-fold. First, it is a play on the recycle emblem. Being “green” is a big deal nowadays (depending on who you ask). But that is less important as the other two reasons. First, the design is meant to point to the fact that Christianity sees eternity differently from any other religion on the planet. In Hinduism, it is believed that people who die are reincarnated into another form. The form a person takes depends on how they lived their previous lives. If they lived rightly and did good things, they will come back as a better person with a better life. If they have been evil and horrible, they’ll come back as someone in a lower caste (even though the system is supposedly no longer in use). If they’re really bad, they’ll come back as a roach or beetle. For atheists and secular humanists, death is the ultimate end. There is nothing afterward and we end up being worm food. For Buddhists, we just cease to exist. For “good” Muslims (those who actually follow the Quran), they might be allowed into heaven and gain 72 virgins. There are many other views as well, but none are like Christianity. This week’s (second) design is called He Delivers. The design is in the Occupations section of our store and is a play on the Postal Worker. The design shows a red stamp with an image of Jesus and the Greek letters Alpha and Omega. Obviously, the postal workers make their rounds delivering our mail. Some of it is junk – circulars, efforts by car and cable companies to get us to use their service, etc – and some of it is stuff we need. Things like our bills (ok, you could argue that we don’t need these but…), letters (you know! those things that people write on paper…the old email? ), and packages that we’ve ordered. Unlike the postal workers, when we talk about Jesus delivering, we are talking about His sacrifice and the effect it has on anyone who recognizes their sin and repents. Jesus’ deliverance is from the sin in our hearts. He cleanses us completely and moves us from the kingdom of darkness into the kingdom of light (Colossians 1:13). He has delivered those who repent and trust in Him from the wrath that awaited them from a just God who must punish sins. His deliverance is the most amazing thing that a man can experience. Sadly, like the mail we receive, many don’t want anything to do with the deliverance that Jesus offers. They see His wonderful offer like you and I see the junk mail. They rebel against Him and mock His life and death. The truth is, the deliverance that Jesus offers is more valuable than the most precious piece of mail that we could ever get. If you haven’t been delivered by Jesus, please repent of your sins and trust in Christ alone to save you. Please, while there is still time! This week, we are reviving the Design of the Week posts. We start off with a design for Father’s Day called World’s Greatest Abba. The Chaldaic-Hebrew form, as ab is the Hebrew form, for the Greek pater, “father.” Instead of the definite article which the Hebrew uses before the word, the Chaldee or Aramaic adds a syllable to the end, producing thus the emphatic or definitive form. It is used to express a vocative case, and therefore is found in all the passages in which it occurs in the New Testament (being in all, an invocation): Mar_14:36; Rom_8:15; Gal_4:6. It is an awesome thing to know that, while God is holy, just, and righteous; He is also a Father to those who are His. We can draw strength from Him and run to Him when we are in trouble. This is the greatest comfort when trials and tribulations come! What’s happening with the blog? For the two of you that still read this blog (thank you! ), I wanted to let you know that starting next week there will be some changes. All of this is what I hope to do and may be subject to change depending on what is going on in my personal life. Starting next week, Mondays we will be posting a Bible study that you can follow along with. We will be going “line by line” through different books of the Bible. As would be appropriate, we are going to start in Genesis! 🙂 This will be done by myself and the divisions of scripture will be dependent on what I can get done with proper study and prayer. Because designs have become sporadic lately, we are going to make Wednesdays the potpurri day. This will be a mix of designs, events, and other blogs that I have been studying for. Fridays will hopefully be a day of focus on what is happening to Christians around the world. We have been troubled by what happens to Christians outside of America and hope to provide a short glimpse of the trials, tribulations, and death that they face on a daily basis just for calling themselves Christian. Sundays will still be for newslinks and will still offer a mix of Christian stories to keep you up on the latest happenings from a Christian viewpoint. We hope to be more diligent about getting things posted on time and appreciate your time and patience in reading this blog. We would be extremely grateful if you would add us to your blog roll, pass along the link to both the blog and our shop, and find our page on FB. Our main desire is to glorify God and see the lost find the gift of salvation in Jesus Christ, and we would like to thank you for reading this blog and hope to have much more interaction as the blog grows! This week’s design is called Context. It is a blatant and obvious example of the dangers of taking scriptures out of context. Sadly, many people don’t even take the time to find out if the things that they are hearing at church are actually in context and biblically sound. They sit in their pews (or theater seating) and hear the words being said and pick out the things that they agree with while ignoring the rest. Of course, this doesn’t happen if the “pastor” knows his audience…I mean flock…and just preaches what he knows they want to hear. If it is possible for someone to go through scripture and pull out different verses to make God say what they want, then who is the authority? If we can twist verses together to meet our lives where they already are, then where is the power of the gospel? This is not the way that things should be! Scripture is THE authority and it should be us that changes to conform to scripture and not the other way around! Sadly, there are numerous men and women who claim the Lord as their Savior and do everything they can to lead people away from their only hope of being saved from the wrath of God. They claim to be men of God who are rightly using the Bible to live the lives they do, all the while twisting the scripture and teaching others to do so. This is dangerous and could cost people their eternity. It is important that we study the scriptures in context so that we can apply the truth to our lives and become more Christlike.